Attractive sequence of spaces up a sloping garden. This property has a very steeply sloping garden and various works had been done over the years with limited benefits toward realising an attractive manageable and useable garden. This is a very common scenario for me to address and I was able to discuss many options with the client and show them many similar successful previous projects in my portfolio. 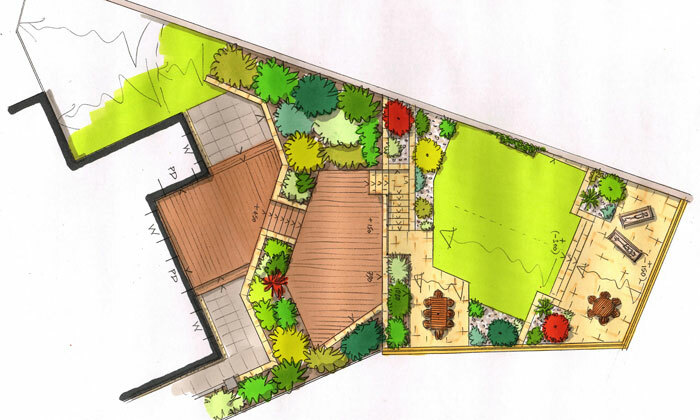 The client wanted a garden planning service to achieve a coherent layout and character, with safe and attractive access between levels of useable garden space. After a detailed survey I developed a design for an attractive sequence of spaces with attractive access features and well proportioned useable spaces to suit their overall budget. I was able to incorporate various existing elements like walling into the new design with the use of cladding details to keep a coherent character. Many gardens are developed like this property was, over many phases, often at great expense over the years and achieve very poor results. This demonstrates the value of having a complete master plan produced for your property to make sure all money you spend and work done is going to achieve what you need. The end result of this design was an attractive blend of contemporary and traditional terrace gardens culminating in the upper evening sun terrace with summer house to enjoy spectacular views all year round.